Stuck for Christmas present ideas? We've got the perfect solution! BHP Sport have released a fantastic 6 DVD Box Set of the 2006 Speedway Grand Prix series, featuring all of the action from around the globe. The entire box set is just £19.99 (plus p&p) and there are 2 bonus DVD's featuring the World Cup series too! These exclusive box sets are available from the company's website at www.speedwaydvd.com. 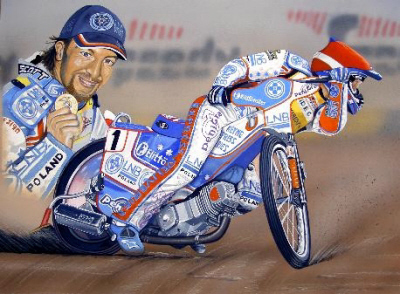 Who finished in 3rd place in the 2006 British Speedway Grand Prix? Answers via email to comp@speedwayplus.com - please include your full name and postal address. Closing date for entries Sunday 3rd December 2006. Jeff Scott accepted an invitation to assist with preparation for last year's indoor meeting at Brighton. It proved to be very hard work but an ultimately rewarding experience. In this article he gives us an insight into a side of the sport that few of us ever see. This year's Bonanza takes place on Sunday 10th December - Full details on The Brighton Bonanza Website. Adrian has been a fan of the Poole Pirates for more than 50 years. He manages to sneak eight riders into his team, one of whom is the avuncular Norman Strachan. Redcar's Chris Kerr has a new website at chris-kerr.com. It contains the usual profile, pictures and sponsors pages. Does anyone remember a journalist/announcer called Bernard Holding? What about a rider called Alf Viccary? If either rings a bell, please check out our Can You Help? page. Jim Blanchard has produced another of his excellent paintings, this time featuring the current world champion in action and portrait. Find out more on Jim's website. Don't forget you can simultaneously do you christmas shopping and support this website through our online shop in association with Amazon.co.uk. "Regarding the Ken McKinlay photo, I am sure it's Ken and not Ove. Being first a Norwich and later a West Ham supporter in the 60's I saw both often. I'm quite sure its Ken. Good to see the Southampton pics, I had forgotten the Briggo jersey. I remember Southampton coming to Norwich in '62/3. Briggs/Knutsson were a formidable duo, Briggs always seemed a hard rider in those days before he came to stand as speedway's best known rider. When he came 2nd in Sportsman of the Year BBC TV almost admitted the existence of the sport! I keep my narrowboat near Long Eaton. Looked to me last year as if the site had been cleared, but I could be wrong. The stadium was probably about the roughest in the sport when I went there in the 80's. It was there that I heard of the tragic death of Billy Sanders (I was a Witches supporter then, as now)." "Nice to see my grandfather's name mentioned here, Tom Morgan, Broadsider. He doesn't seen to get a mention on many Vintage speedway sites." "I agree with some of your comments regarding the 'fairness' of the play-offs. As a Coventry fan I was elated when we beat Belle Vue in the 2005 play-off final, every fan wants their team to win the league and I was no different. But as I celebrated I could not help but feel sorry for the riders, supporters and promotion of Belle Vue speedway. Over the season they deserved to win the league. You won't see Man Utd play Chelsea in a play-off at the end of the premiership will you?. No the teams who finishes top wins the league. I also understand why the play-offs are held in speedway though. How are BSI meant to market British speedway if 50% of the teams feel their season is over 3 months into it?, they can't. Is it fair also for a teams season to be wrecked if one of their top riders is injured in the first match and misses 5-6 weeks of the season. Under the old format that teams season could be considered over as they wouldn't have much chance of overhauling everyone? One possible solution could be to follow the example of Ice Hockey. I also take an interest in the Coventry Blaze Ice Hockey team and noticed that when they won the grand slam a couple of seasons ago, they won a trophy for finishing first in the league, they then went into a play-off competition for a completely seperate trophy. This would mean that the team winning the league outright would get the recognition they deserve and the teams in 2nd - 4th would still have something to go for at the end of the season." 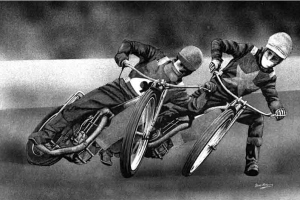 We look back at the first-ever speedway meeting at the Arena Essex. Can you remember which year it was and who emerged victorious from the first night's racing? Colin has been a Glasgow fan since the seventies and includes entertaining Aussies Shane Bowes and Merv Janke in his side. There's also room for Shane Parker whom he describes as "a dude with much coolness". There are a number of new pleas on our Can You Help? page. Do you have any pictures of Jimmy Gooch, a Luckhurst conversion, a 1985 Ellesmere Port body colour, video footage of Ken McKinlay or any Reading away programmes. If you do then someone would like to hear from you! speedway14.com is a website that specialises in memorabilia, though there doesn't seem to be much on there at present. The above picture from our Southampton Pictures has divided opinion between those who think it's Ken McKinlay and those that think it's Ove Fundin. We're still firmly of the opinion that it's Ken, as indeed Gary McCormick the original photographer believed. We've featured it here in a larger version to see if that will clatify things once and for all. Ken or Ove? "Looks like Ove Fundin to me but the bike is not the Norwich No 2 track spare." "That was definitely Ken McKinlay in the Southampton pits sequence." "Looks like Ove to me." "Are you sure that it's a picture of Briggo signing an autograph? I would have said that he's trying to figure out how to open his wallet, a rare event and never before captured on camera!" "Just found the site, unbelievable! All my yesterdays with the track photos, Newport rule OK! I have downloaded the magazines. Keep up the good work. " "As one who has, in the past two years, had my eyes opened as regards Czech speedway, it would be good to know where Brezolupy is on the Czech map, as it would the other more obscure (to me anyway) tracks you feature in your photo columns. Great pictures, supplementing a great website especially during the winter months!! " "Another Long Eaton Invaders fan here. So many happy memories of watching speedway with my dad and brother, the Invaders are dearly missed. The pictures of the derelict stadium are so sad. Anyone know any news at all? I haven't heard anything on the stadium in over a year." Stan Bradbury has been one of the driving forces behind Canadian speedway since he moved out there in 1957. His advice and practical assistance have helped many aspiring riders over the years. David Hensby pays tribute to this remarkable octogenarian. Here's a sneak preview of the new home for the Birmingham Brummies. These pictures, courtesy of brummiespeedway.co.uk, show the place before track construction commenced. Chris started out watching the Halifax Dukes and followed them to Bradford when the club moved to Odsal. He's also an old friend of David Walsh and finds him a place in his seven. Barry Dalton is still trying to complete his Peterborough programme collection. Full details of his 'wants' are on the Can You Help? page. "As an ex Long Eaton supporter for many years, it brings tears to the eyes to see the track in a derelict condition. " "As an Edinburgh supporter of long standing, I am not "the" Pete Adams of Coventry, Cradley Heath and Wolves fame, I read with much interest the article from Russell Lanning and his comments on Showered in Shale and speedway generally. It was interesting to find out what Russell was up to having disappeared from the sport after becoming quite a larger than life character in the National League in the 80s with Eastbourne and Wimbledon. Rarely did Russell ever bring a duff team to the old Powderhall track. I would say most of the time it was a battling Les Collins versus the rest every time Lanning and his men came up here. More often than not he left triumphant. I always believed Russell to be a promoter in the true sense of the word, he got off his backside and seemed to want to shout how good his team was. We jeered and booed him but looking back he often had the last word. Edinburgh press man Mike Hunter was always full of praise for Russell because he could probably see the great job he was doing. Speedway misses personalities like him and I was impressed to read of Poole promoter Matt Ford's contact with Russell, he clearly is a shrewd man knowing the old Lanning media magic might help him. Hopefully Matt Ford might sweet talk Russell back to speedway, although if he is now in the national media it's going to take a bit of persuasion. His father Dave always had a slogan I think in the Speedway Star saying: love him or loathe him, you can't ignore him. I hated him at the time, but looking back he really sold the sport and has been missed. Good read." 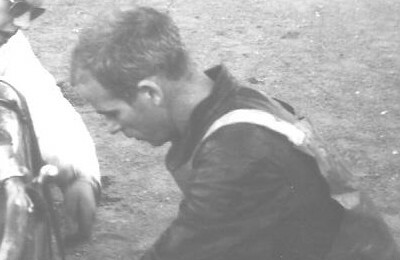 "Love the pics of old Soton Speedway, remember it well, was always there.......remember Briggo's black and white jersey that he always wore and eventually they set fire too............."
"The photo of 'Ken McKinley' looks more like one of Ove Fundin to me??" We're pretty sure it's Ken. Ken Nicholson takes a look at the play-offs and finds both positives and negatives in the system. We managed without them for many years, do we need them now? Andy Reid was the photographer for these pictures of the Brezolupy circuit in the Czech Republic. Michael first watched the sport at Milton Keynes in 1979. He includes some Knights in his selection alongside his childhood friend Jason Bunyan. Not that we have completed another Speedway season I thought I would let you all know about my new Picture DVD. Titled "Ashfield Action 2006" this year's DVD contains approximately 3,000 colour images, yes 3,000, which can be viewed on your PC or Mac, you can print copies for your own use, you will also be able to view them on your TV if you have a DVD player that can handle picture files. Once again a percentage of all sale will be passed onto a Glasgow Rider at the start of the season. In previous years David McAllan (twice), James Cockle and Trent Leverington received a donation towards their bills. "I enjoyed the story and photos on Powderhall Stadium, home of the Edinburgh Monarchs, although it is sad to see the state of that grand stadium in your photograph. I see that Dave Gifford has written about the opening meeting at Powderhall and how he top scored for Berwick when they beat us that night. Yes, it's true, the track was very deep, so deep in fact that I was grounding the chainguard on the left side of my Jawa in the corners,...but I enjoyed it! Giffie only top-scored because, as a Kiwi, he reckoned that I still owed him a few dollars from when we raced in New Zealand and this was his chance!" "Funny, could have sworn that the great English World Champion Tommy Price was our manager in 1965 when we won the triple crown! I seem to remember a certain Dave Lanning was our publicity officer, and did not take over till 66. He led us to win the London cup in 66 & 67. As most the trophys were not availible the team photo showing the Hammers with the triple trophys does show Dave as it was not taken until 1966. Will not tell you what the Hackney fans called him! I think it is fair to say that of all the promoters/managers, only Dave and Len Silver could hold a hat (burning or otherwise) to the great Johnny Hoskins." "I have just read Russell Lanning's review of Showered In Shale. After sounding off about what he does, he says he is involved at The Sun newspaper. If he is, is it not possible for him to give our sport a mention once in a while. I think speedway should get more of a mention in daily newspapers than the small amount of coverage that it gets at the moment. If Russell has any clout, then surely he could give us some form of regular reports etc." "Good to see that Russell keeps in touch with the sport. I was never his biggest fan, but the guy was an excellent promoter, perhaps someone should persuade him to come back. Urgh!! "The Mail on Sunday" I couldn't believe that he works for that rag, but what the ???. Glad to see Philip is doing ok as well. I did some work with Philip for Mike Bennett years ago and always found him an ok guy." Rusell Lanning one-time promoter at Eastbourne and Wimbledon now makes his living working for the Mail on Sunday. In this article he reviews Jeff Scott's "Showered in Shale" book and gives his views on the sport as a whole. Given his family links with the sport, he's more qualified than most to comment. Find out which current promoter he rates, what his father and brother are currently up to and (of course) what he thinks about Jeff's book. 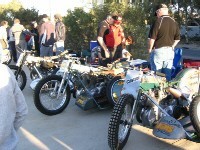 Pictures of some of the 50+ machines on show at the recent Gillman Classic Speedway Night in Adelaide. These photographs are courtesy of Penny. Bob first went to watch Ipswich in 1969 and has followed the club on and off since then. Billy Sanders is just one of the Witches' legends that he includes. Kevin Little is having "a little bit of a do" to mark his retiral from the sport. His farewell meeting will take place at Redcar on 5th April 2007. Full details will be posted on alittlebitofado.co.uk. When asked about his retirement, Kevin joked that "No-one has ever had me in their Dream Team so I give up now!!". Some brief highlights from the Central Coast Speedway open and practise day held last Saturday 28th October have been uploaded for viewing at 2xtremevision.com. Also features interviews with Jason Doyle, Chris Holder, James Holder, Lee Herne and Jaye Herne. USA Speedway are the exclusive competition affiliates for the AMA. Find out all the latest stateside news on their new website at usaspeedway.org. "Great story from Ian MacHoskins about how he started Glasgow Tigers at the White City Stadium. As a wee boy, I lived just down the road from White City in Govan Fire Station where my dad was a Fireman. Every Wednesday night he would take me to the Speedway where I was a red-hot Tigers fan, even my tricycle was painted red & white! My favourite riders being Junior Bainbridge & Ken McKinlay, and I was amongst the hundreds of kids queuing up after the meeting to get autographs and discarded 'Gas Goggles'. Nowadays I import the popular and more technical Scott Speedway Goggles! Ian was a true showman, and he could still whip up a crowd these days if he was still promoting. He always had a stunt planned for each meeting and wherever he was promoting, the atmosphere in the crowd was buzzing. We could do with more promoters like him these days. Happy Days for Scottish Speedway, especially when Ian's hat was set of fire! Now, where did I put those New Zealand dollars?...I must get a copy of the Hossie book!"